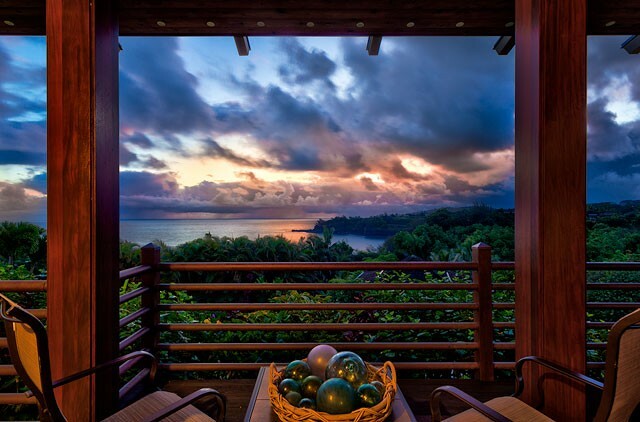 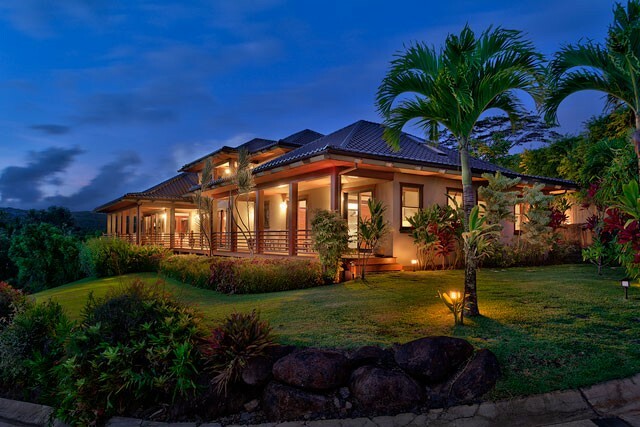 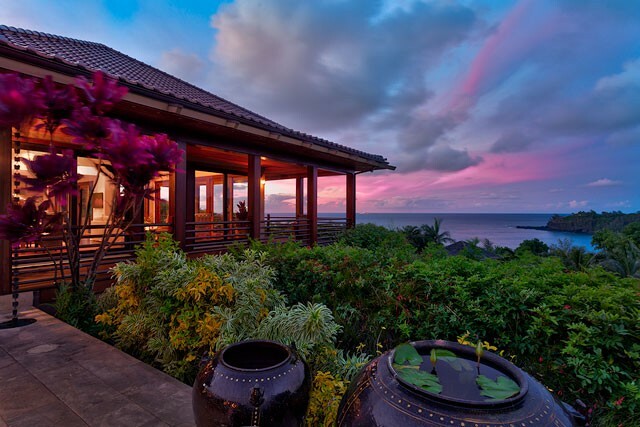 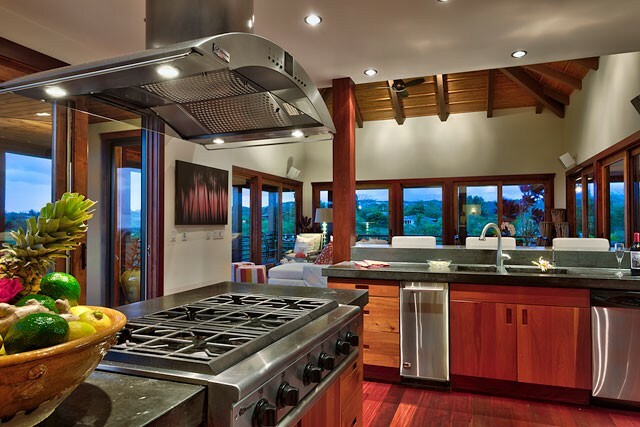 Heavenly View Estate – Luxury Vacation Homes, Inc.
Aloha and welcome to the Heavenly View Estate. 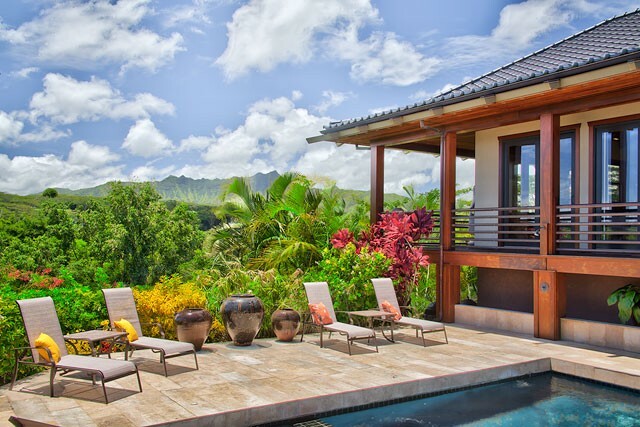 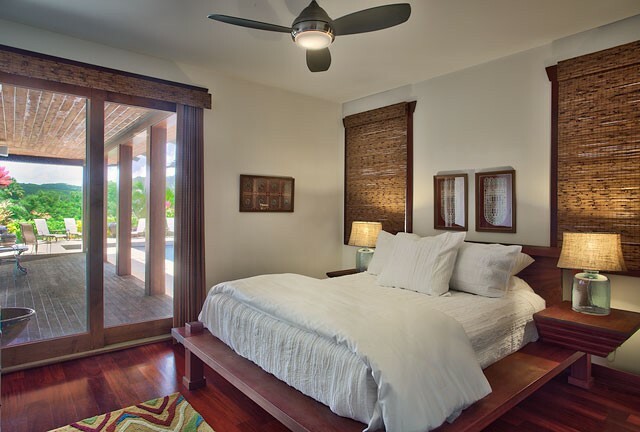 From this wonderful oceanview property guests can walk right down to the beach at Kalihiwai Bay. 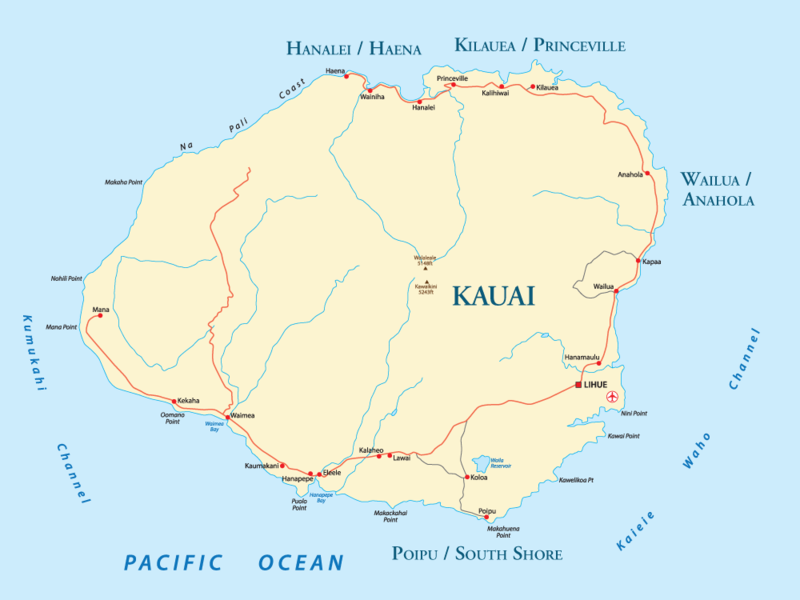 Or they can drive 2 minutes to Anini Beach Park or even go explore many of the other beaches to choose from such as Tunnels, Secret Beach and more. 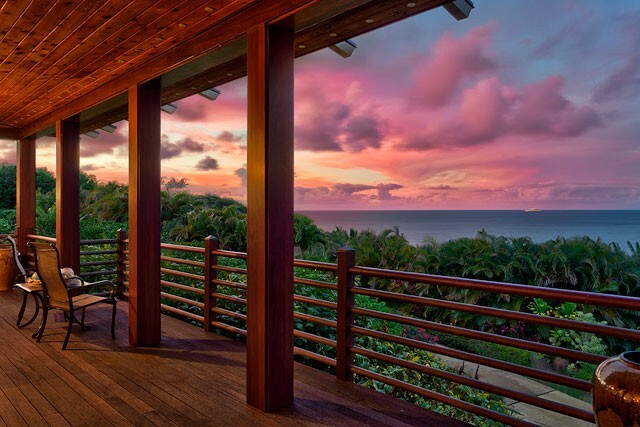 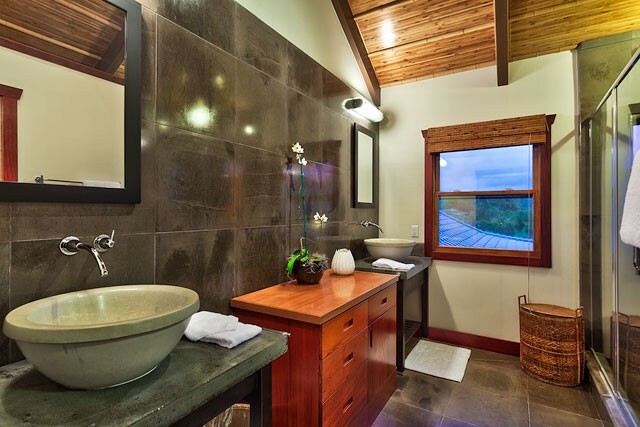 A spirit of peaceful tranquility, harmony, and balance awaits you at Heavenly View. 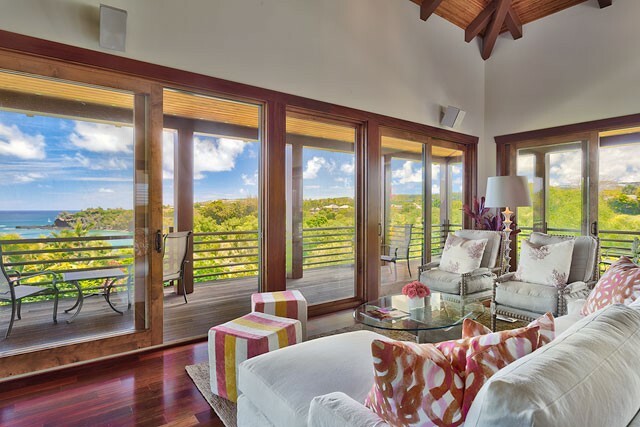 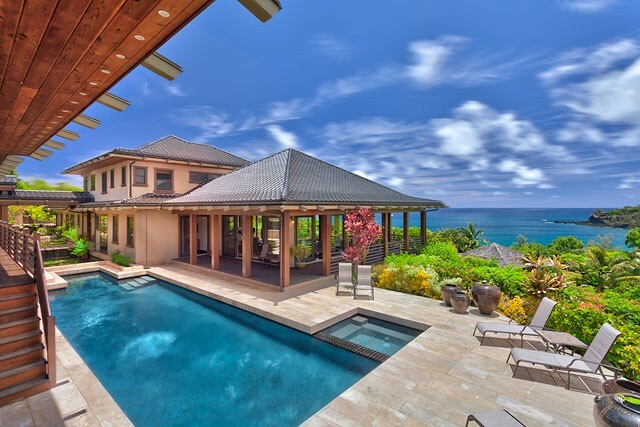 Designed by the award-winning firms EDI Architecture and Trio Design Group, this newer luxury Asian/Modern custom home with detached guest home is a luxurious island retreat – a serene and peaceful place to relax and enjoy the warm tradewinds and the heavenly ocean views. 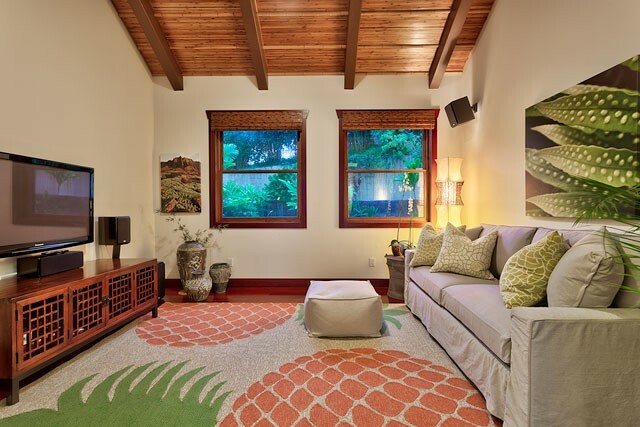 Many of the building materials, artifacts and furnishings were hand-picked and carefully transported from Asia. 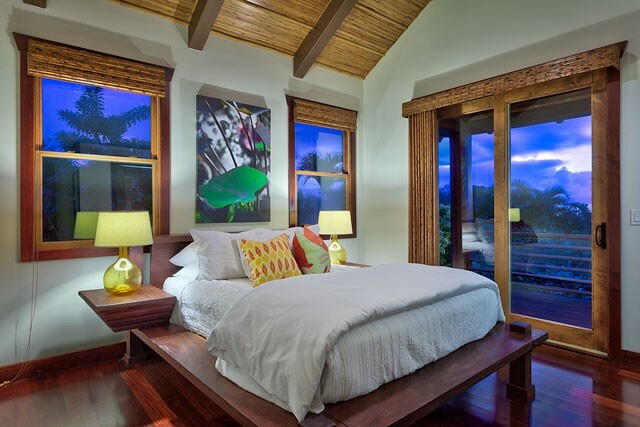 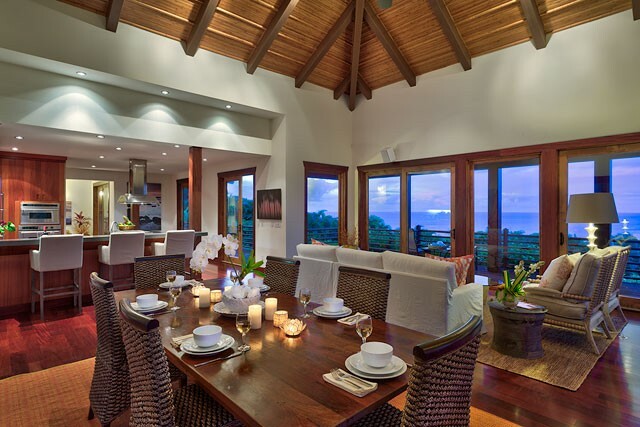 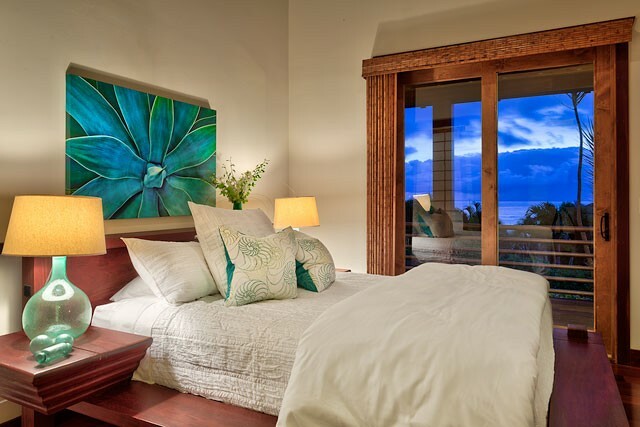 The home has spectacular ocean views of the Kalihiwai Bay and the ocean as well as unforgettable views of the Napali coast mountain range. 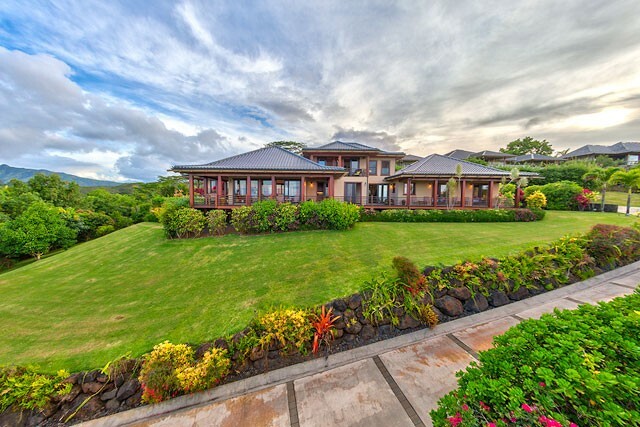 The house is 3,500 square feet with five bedrooms, a media room, and five bathrooms. 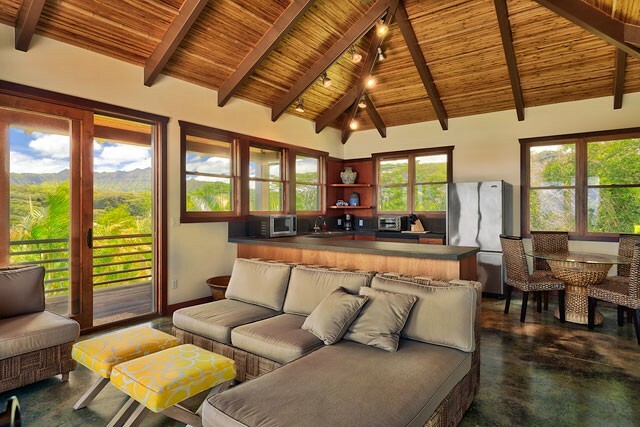 The home features custom hardwood floors of pyinkado wood imported from Burma, custom concrete counters, and stone tile imported from Belgium and Saudi Arabia. 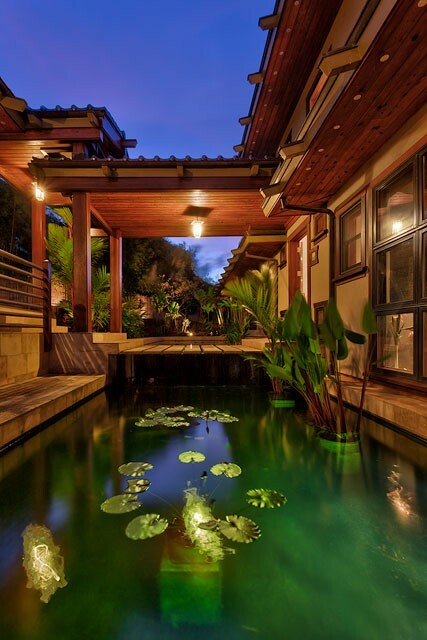 Inside the front door, water flows down a custom waterfall into an interior pond. 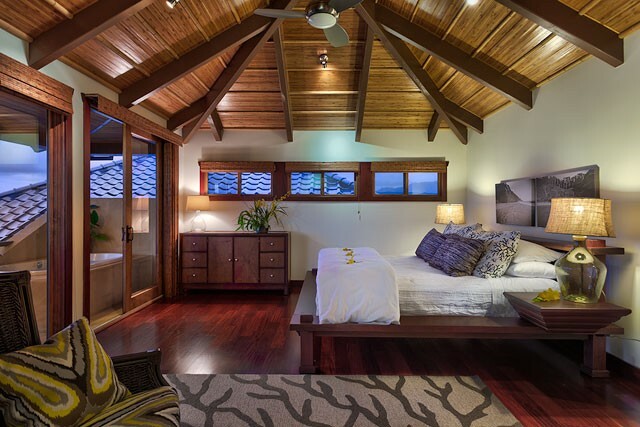 Beautiful custom-designed shoji doors separate the media room and one of the bedrooms from the rest of the house. 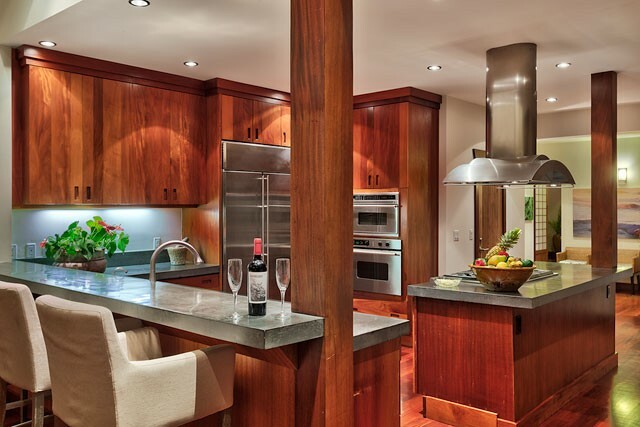 The fully equipped gourmet kitchen includes stainless steel appliances and fixtures. 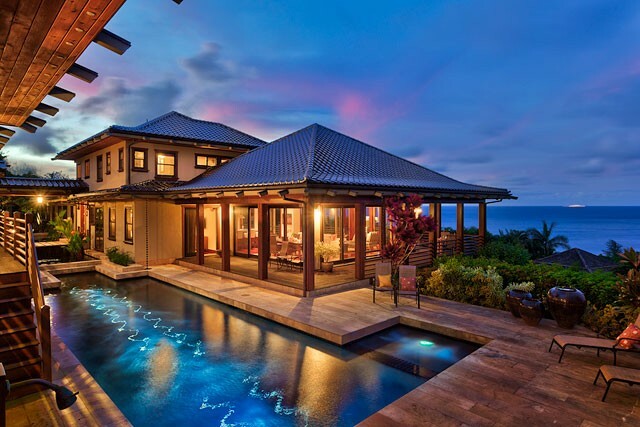 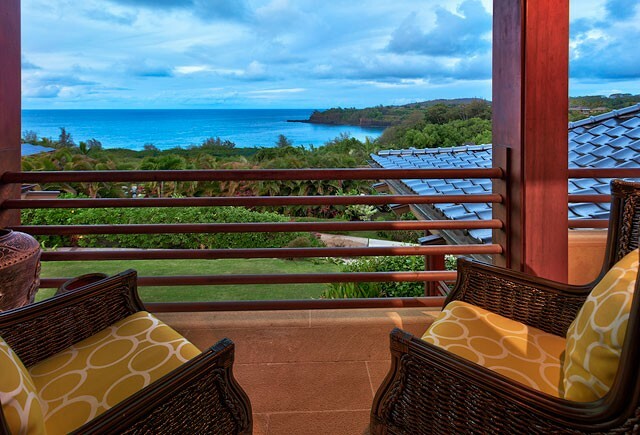 A wrap around lanai overlooks the ocean and mountains. 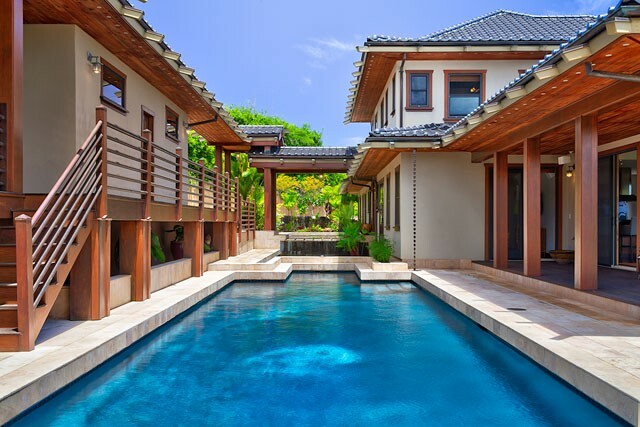 Between the house and the gym/sauna/garage building, there is a black bottom swimming pool, a spa, beautiful koi ponds, and an outdoor shower. 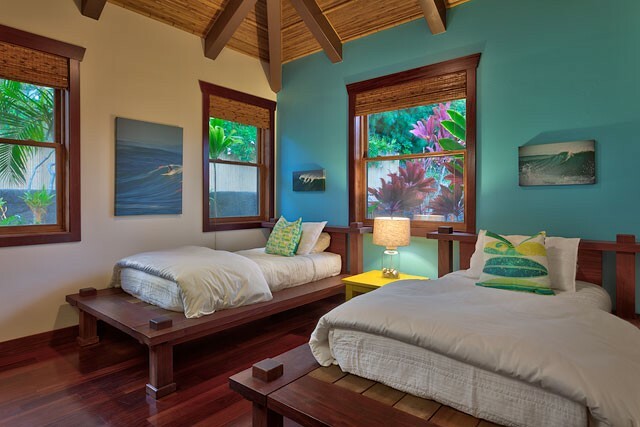 Bedding: 1 King 4 Queens and a set of twins. 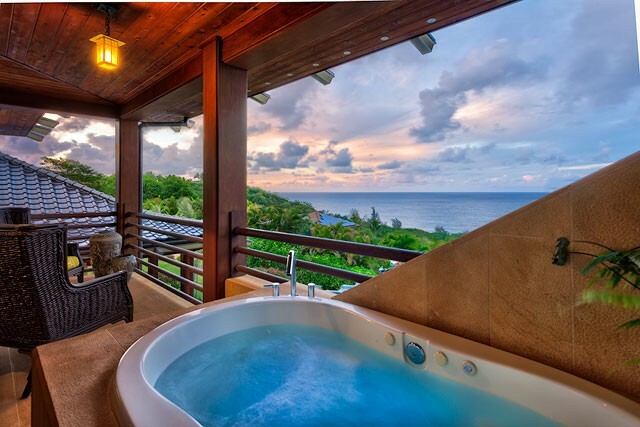 Neither the swimming pool, spa, nor ponds have a safety fence around them so guests agree to watch children at all times.